"Rather than try to be a role model, I'd rather be a real model," he says. On a sticky autumn day in sunny Atlanta, the rapper T.I. (who now goes by Tip; more on that later) is riding his BMX bike around the old neighborhood. "Hey T.I.," a woman yells. "What's up!" he cheerfully shouts back. As he rides with ABC News' Dan Harris in tow, Tip points out houses with significant meaning in his life. 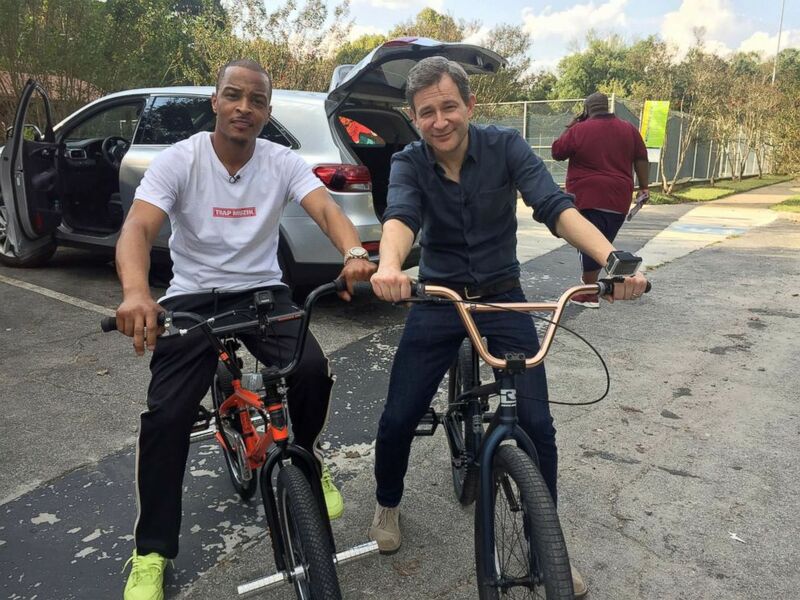 (ABC News) Rapper T.I., who now goes by the name Tip, shows ABC News' Dan Harris around his hometown of Atlanta. "The house right there," he explains, "That's where I got my first kiss… on the back porch. My girlfriend — third grade — she lived right there." "You started early! Third grade!" Harris interjects. "I joined the band so I could stay after school. … Made my Uncle May buy me a saxophone just so I could stay at the school, and pretend to practice with the band. I was walking down to her house and I got a kiss. Still don't know how to play the saxophone," Tip says with a chuckle. But Tip, a three-time Grammy winner, Tony-nominated composer, real-estate investor, actor and philanthropist, has learned how to do plenty else. Since he burst onto the national rap scene in 2003 with his hit album “Trap Muzik,” he's been a pioneer of sorts, helping to popularize trap music, the popular style of music typified by heavy use of percussion, synthesizers and darker tones, with lyrics about drug use, drug dealing and partying as well as poverty, violence, and the harsh realities of living in these environments. It's a lifestyle he knows all too well. Before he was even a teenager, Tip started selling crack. He was arrested and sent to jail so many times, he says, that he can’t even count them all. "Did you ever think you'd be sitting where you are now? Doing songs for ‘Spongebob’ and nominated for a Tony?" Harris asks. "I mean, man, I knew I was good," Tip says. "But I did not know how to make a way to get where I needed to be in order to make, you know, my dream a reality." We find the multi-hyphenate at an interesting juncture. His ambitions are large. His role models are Harry Belafonte, Jay-Z, former Ambassador Andrew Young. He's promoting a new album, “Dime Trap,” which he's described as a "Ted Talk" for the trap genre. But he's 38, which in the rap world can be good (see Jay-Z) or bad, if you look at the average age of most of the young rappers popularizing the genre. It's the age-old fight that it seems rappers his age find themselves in; a battle for relevance in a genre that celebrates drugs and crime while chasing his insatiable desire to become a respected entrepreneur and musical legend. His hustle began early. He was born Clifford Harris, but his family always called him Tip. It was his moniker when he first started rapping, and what he has now decided to go by. He showed us his old elementary school, Grove Park, where he started selling candy at a young age to help his mother, who was on welfare. According to Tip, he would give his teacher a Snickers in exchange for being allowed to sell to his classmates. 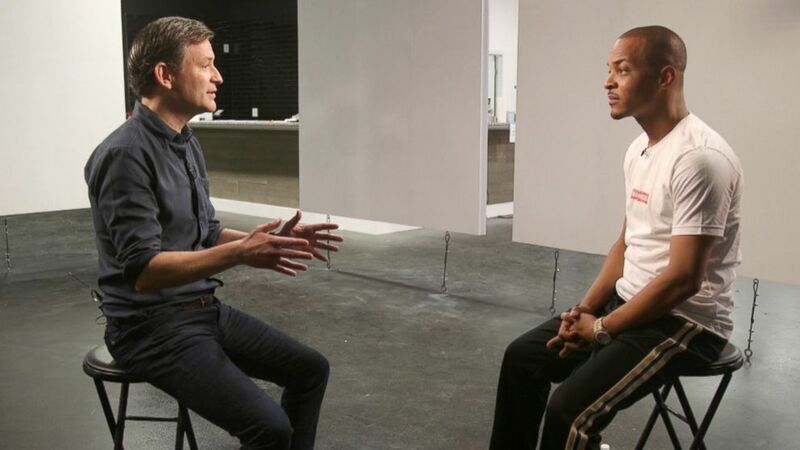 (ABC News) "Rather than try to be a role model, I'd rather be a real model," rapper T.I., who now goes by the name Tip, told ABC News' Dan Harris. "[I] had to get it done," Tip said. "That's [a] hustla's tenacity." But that business acumen soon led him to something darker; selling dope. At its most chaotic, he says his life was filled with weekly shootouts and jail terms every one to three months. At one point, he says his family sat him down and forced him to sign life insurance. "The way... the rate you're going, you're gonna die," Tip recalls his uncle saying. "And we don't [want to] worry about how we're gonna bury you, so just sign this paper, so we'll have, you know, a way to send you off nice once you go out there and get your head blown off." His salvation came through music. He got his first record deal through Arista for his debut studio album, “I'm Serious.” But when it didn't perform as expected, the label dropped him. Tip moved to Atlantic records, in conjunction with his label, Grand Hustle, to release “Trap Muzik” in 2003. It was co-produced by the production duo, The Neptunes. "That first album was about a young man who was talking about his firsthand experiences in the trap, doing these, engaging in felonious activities. And his transition into music, celebrity, artistry," Tip said. He's the self-proclaimed creator of trap music, though other musicians, including fellow Atlanta rapper Gucci Mane have also been credited with its start. Now, 15 years after his first hit album's release, the rapper is opening a pop-up museum in homage to the genre in his old Bankhead neighborhood. When visitors walk into the museum, they’re greeted by a Pepto Bismol-pink car, donated by Atlanta rapper 2 Chainz from his pink pop-up "Trap House." Then, visitors are faced with a wall of simulated blocks of cocaine, a nod to rapper Young Jeezy, who is also known as "The Snowman." The exhibit for Gucci Mane is elaborate; simulated marijuana peppers the kitchen table, fake roaches litter the floor, a pot for cooking crack sits on the stove. (ABC News) Since rapper T.I., who now goes by the name Tip, burst on the national rap scene in 2003 with his hit album "Trap Muzik," he's been a pioneer of sorts. It may seem like it's glorifying a lifestyle that has taken so many lives, either through death or imprisonment. But for Tip, it's a history lesson. "This is what it is, these are the humble beginnings that a person came from and from this they changed their life around and if you don't take notice to the beginning of it then you can't really appreciate the destination that he arrived to at the end." He makes sure to point out the jail cell that's part of the exhibit. "These are the most recent ones of us who have had to overcome — Meek Mill, Kodak Black, Ralo, Kevin Gates, to name a few — these are the guys that will be celebrated here and I think it's extremely important that everyone knows that either death, prison or music is probably the likely outcome to the lifestyle," Tip said. Of course, his life looks nothing like his old one. He's now making his name in movies, having been in 12 of them. His latest is as ‘Dave’, in "Ant-Man and the Wasp". And thanks to his long-running VH1 show with his wife, Tameka "Tiny" Harris, he's known to a whole generation as a doting, if not overprotective, father of seven. In fact, he co-wrote a song for “Spongebob: The Musical” with his son Domani. He also has a show out now on BET, “The Grand Hustle,” an “Apprentice”-type show where competitors aim to join his team for a six-figure salary. But don't compare him to Donald Trump. Nowadays, there's no love lost between Tip and the president. He's been openly critical, calling Trump’s policies racist and dangerous. So when his friend and frequent collaborator, Kanye West, began wearing a “Make America Great Again" hat and declaring that slavery was a choice, Tip felt he had to reach out. "I think, man, I think his isolation and disconnect with people, plus his fascination with power and fame has him a little... I think he's a little jaded, if you will. But I do also believe, when he said slavery was a choice, I don't think he meant it the way people took it," he said. The duo recorded a track together, “Ye vs. the People,” in which West and T.I seem to spar over West's support of Trump. And while some have speculated that West's fawning over Trump has been to garner press for various projects, Tip disagrees. "To be honest with you, Kanye's so arrogant to where he don't think he need it. He don't believe that he needs anything provocative. He thinks that, man... when Kanye drops music, the world stops." 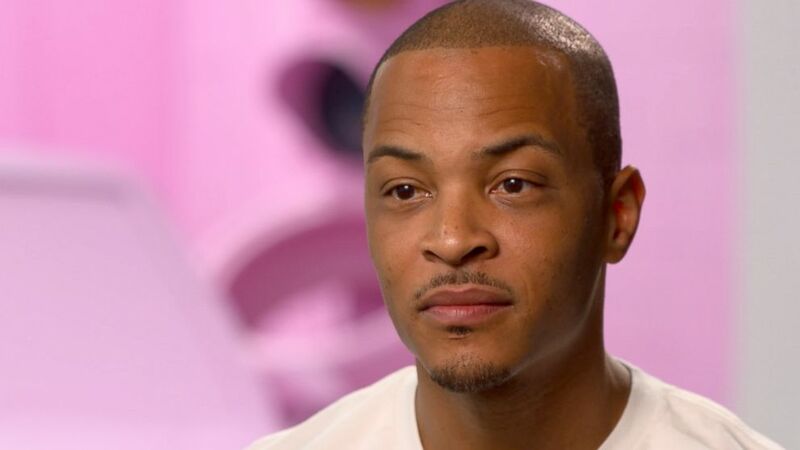 Tip feels it's his responsibility to speak up and give back. His album “Us or Else” spoke to the racially divided times in which we live. His charitable organization, K.I.N.G., focuses on education and veteran homelessness. Nowhere is his activism as strong as in his beloved Atlanta. In his old neighborhood, where home prices have skyrocketed due to gentrification, he's on a mission to buy and flip as many buildings as he can and turn them into affordable housing. His venture "Buy Back the Block” has purchased nine properties already — in association with Dynasty Real Estate Development and APD-Urban Planning and Management. Tip is also saving an old neighborhood favorite that was close to shutting down: Bankhead Seafood, where he says he and his grandmother used to come for fish that was "fried to perfection." Tip and fellow rapper Killa Mike bought the property, and plan to tear it down and rebuild the affordable eatery under the same name, using the same recipe the previous owner did. "With as much growth and opportunity that's going on in my community — and, you know, Mike's community as well — we refuse to be left behind," he said. If he feels any tension in this balancing act of his — rapping about the trap and being a good role model and father — he doesn't show it, launching into one of his famous aphorisms. "I have enough things going on where I don't have to chase sensationalism, I don't have to be provocative for no reason just because my personality lends itself to controversy," he said. "Rather than try to be a role model, I'd rather be a real model."